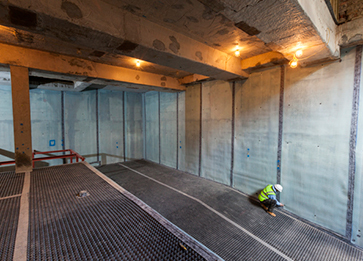 Triton approved contractors, Advance Property Preservation, installed a Type C (BS 8102 2009) structural waterproofing system in the construction of a luxury domestic basement. The property is a late Victorian, six-bedroomed detached home in Notting Hill, London. The main contractors excavated beneath the whole of the existing building, and the front and rear gardens, to extend the small original basement to a much larger, two storey space. The new basement will accommodate a plant room and swimming pool on the lower level and a bar, steam room, exercise room and cinema on the upper level. The Type C system comprised BBA certified Platon P8 cavity drain membrane to the floor and BBA certified Platon P20 cavity drain membrane to the walls. Perimeter channels were formed to house Triton Aqua Channel drainage conduit to divert any water entering behind or beneath the membranes to the sump and pump system. To allow for maintenance of the system, rodding eyes were installed to the Aqua Channel every 10 linear metres. A Triton sump and pump system (Triton Aqua Pump Pro with battery back up) was situated at the lowest point behind the pool to take any low level water up to a larger sump/pump station at a higher point in the basement from where it will be pumped out. Before installation of the Platon membranes, all new concrete was treated with Triton Anti Lime Coating to seal the surfaces and reduce the leaching of ‘free lime’ which could cause blockages behind the membranes or in the drainage system.